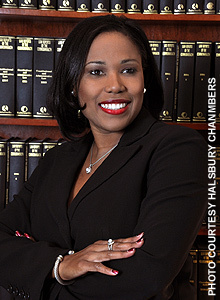 Local legal expert urges Bahamian lawyers to keep up with the pace of change, as international business and cross-border transactions increase and legislation evolves. With international business and cross-border transactions increasing dramatically, Halsbury Chambers partner Nerissa Greene (left) says that it is critical for Bahamians practicing law to keep pace with legal precedence, trends and changes in other jurisdictions. Fresh from attending the International Lawyers Network (ILN) 2013 conference in Miami, Greene says that issues of taxation, employment, energy and natural resources have such global repercussions today that attorneys who practice in The Bahamas need to keep abreast of evolving trends. “It is no longer a luxury to remain abreast of changing judicial precedent, practices and procedures in other parts of the world, it is essential,” says Greene, who specializes in real estate, conveyancing, family law, and civil and corporate law. Greene adds that attending the ILN 2013 conference allowed her to network with attorneys from Asia, the US, Canada, Latin America and Europe. Membership in the ILN is limited and by invitation only. Halsbury Chambers is the official Bahamas member of the association of 91 full-service law firms with more than 5,000 lawyers worldwide. The ILN provides clients with easily accessible legal services in 67 countries on six continents. Earlier in November, estate planning specialist Mikia Cooper, a Halsbury Chambers associate, attended the 1st Annual Private Wealth Latin America and the Caribbean Forum in Miami, helping to boost the profile of The Bahamas. Minister of Financial Services Ryan Pinder was among the speakers at that conference, touting the country’s competence in handling the most complex of wealth, asset management and investment matters. Cable & Wireless Communications (CWC) has updated the brand identity of its Bahamas business, according to Telecompaper. The refreshed brand of Bahamas Telecommunications Company (BTC) seeks to create a new identity for the business and more strongly emphasizes BTC’s customer-focused approach. Continuing on recent trends, Smartcool Systems Inc (TSX-V: SSC) is expanding its ECO3 energy efficiency product distribution network across the Caribbean region. Building outwards from its sales and technical hub in South Florida, Smartcool has signed new distribution agreements with local partners in The Bahamas, Jamaica, the Dominican Republic and Puerto Rico.